08/06/2018 – August 6th marked the official start of the harvest for “Federweisser” (a partially-fermented, yeasty wine speciality) in Lörzweiler, Rheinhessen, this year – the earliest start-date ever. With a must weight of over 90 degrees Oechsle, the harvested grapes of the early-ripening variety Solaris were already exceptionally sweet. Picking for this popular autumn speciality will also begin in the next few days in the Pfalz or Baden. 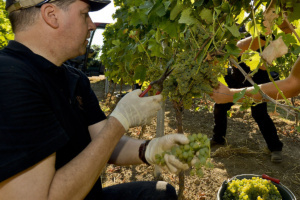 At the same time, harvesting will get underway in some areas for grapes destined for the production of Sekt (sparkling wine), where a fresh fruit acidity is all-important. The main harvest for varieties such as Müller-Thurgau or Frühburgunder (Pinot Précoce) is also anticipated to start nationwide especially early this year at the end of August. For the first time, this even applies to the northernmost German wine region Saale-Unstrut. Later ripening varieties such as Riesling or Spätburgunder (Pinot Noir) are expected to be ready for picking already in mid-September, rather than the beginning of October. This development was initiated by the warmest April since records began, which led to an especially early flowering. The ripening was further accelerated by the very sunny summer, resulting in a vine development which is currently some three weeks ahead of the long-term average. Despite the drought, which has persisted now for some eight weeks, the older vines – thanks to their deep roots – are still in a surprisingly good state of health. However, irrigation has been necessary especially for vines on shallow soils and in young vineyards as water supplies here are mostly depleted. It remains to be seen how the vineyards will withstand the forecasted hot and dry weather conditions. The gratifying size of the crop as well as excellent state of maturity and health of the grapes currently provide very good preconditions for both yield and quality for the vintage. However, a prolonged water shortage could diminish these prospects in the same way as a long period of rain would at the end of August or in September. Winegrowers are therefore hoping for widespread, abundant summer rain as soon as possible but on the other hand for dry late summer weather at the time of the main harvest, ideally with warm days and cool nights. Then nothing will stand in the way of a very good and perfectly ripe vintage 2018.